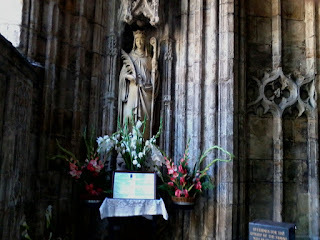 Research for a new novel has taken me on the trail of a Welsh saint. 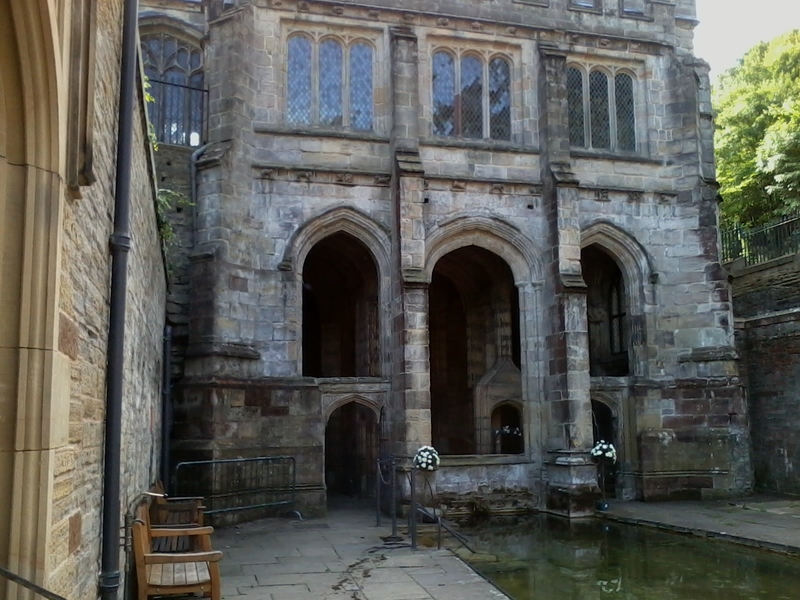 St Winefride's Well is at Holywell, near Flint in north Wales, and was a famous place of pilgrimage both before and after the Reformation. Legend tells how Winefride fled from the advances of a suitor named Caradoc. She ran towards the church built by her uncle, St Beuno, but the furious Caradoc caught her and cut off her head. As St Beuno lifted the severed head a spring of water rose from the ground beneath. He restored the head to Winefride's body and his prayers brought her back to life. Caradoc sank into the ground and was never seen again. The story of a head being restored to the body is one that recurs in folktale and legend. However Winefride herself was a real person who lived in the 7th century. Her Welsh name was Gwenfrewi and she was the daughter of a local prince, Tewyth, and his wife Gwenlo. Caradoc was a chieftain from Hawarden. Winefride became a nun and later joined a community at Gwytherin where she eventually became Abbess. Holywell has been a place of pilgrimage and healing ever since and is the only such shrine to have had an unbroken history of pilgrimage for more than thirteen centuries. Even during the most difficult times for Catholics, during the 16th and 17th centuries, pilgrims still flocked to St Winefride's Well, and many inscriptions cut into pillars in the shrine date from these years. It is customary for pilgrims to pass through the water three times and then to kneel on St Beuno's stone to complete their prayers. This stone - near the steps in the outer pool - is believed to be the one on which St Beuno sat when instructing St Winefride. 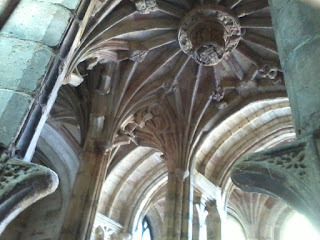 The shrine that now houses the well was built in the early 16th century and is a fine example of Perpendicular Gothic. The statue of the saint dates from 1888. She carries a crook and the palm of martyrdom and there is a thin line around her neck to show where her head was severed. In the picture below you can see the central boss over the well, which shows scenes from St Winefride's martyrdom. Smaller - and very weathered - bosses apparently display the emblems of many noble benefactors, among them Queen Katherine of Aragon and Margaret, Countess of Richmond and mother of Henry VII. Theirs was a time when the fame and popularity of this shrine was at its height. 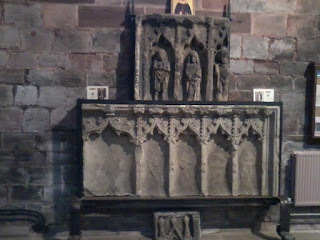 In 1138 St Winefride's relics were removed to Shrewsbury Abbey. The shrine that was built for her there was destroyed during the dissolution of the abbey in 1540, but part of the reredos remains. 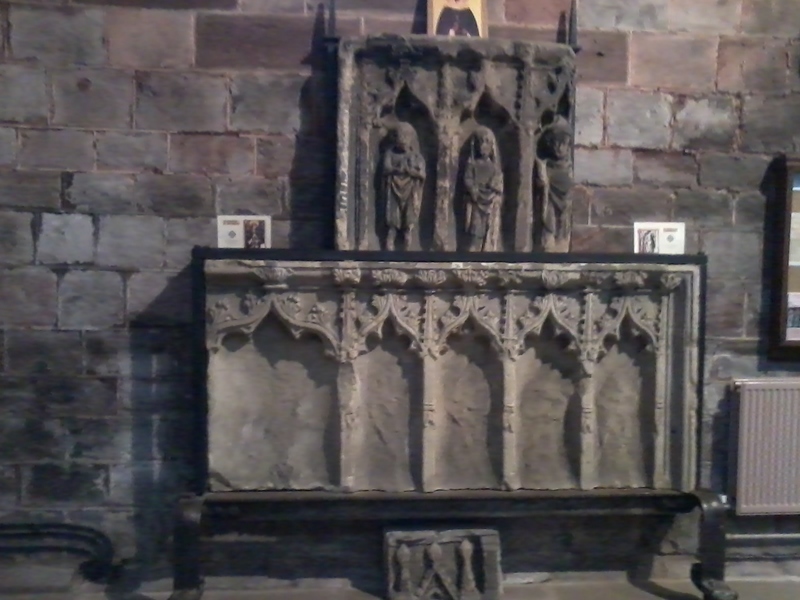 King Henry V sought the protection of St Winefride at the battle of Agincourt in 1415, and the following year he visited her relics at Shrewsbury Abbey, before walking in pilgrimage the sixty miles or so to Holywell to give thanks. In June 2016 the Diocese of Wrexham re-enacted this pilgrimage along the route most likely to have been taken by the king. Quoted in the Shropshire Star, the Rt Rev Mark Davies, the Bishop of Shrewsbury, said, "Whether we are able to physically or spiritually take part in this journey, the ancient pathways of Shropshire will remind us of the rich Christian heritage of this country." I'm so glad she came back to life, and the beastly Caradoc got his come-uppance! Looking forward to reading the book.